TAGES Solidshield DRM disc check; use Patch 1.11 Final to remove. Not available in Australia and New Zealand. Patch 1.11 Final fixes various issues and removes copy protection. 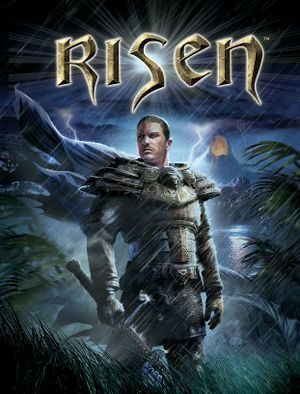 The Risen Unofficial patch fixes a number of minor issues with gameplay, localisation, quests and dialog that were not addressed in the official patches. Works on official patch versions 1.10 and 1.11. ConfigUser.xml overrides ConfigDefault.xml; make changes in ConfigUser.xml unless otherwise noted. FOV setting in ConfigDefault.xml is ignored. Can be set in video card driver. No option in-game and driver override has no effect. Try capping FPS with external software instead. Aspect ratio is fully correct for 16:9 only. 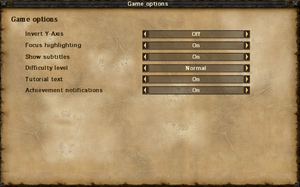 16:10 resolutions are listed in-game but have some UI elements slightly squashed. Under Aspect16x9 change VirtalWidth= to match the equivalent of your aspect ratio for a height of 768 pixels (e.g. use 1228 for 16:10). Change Bottom= to the resolution's full height (not the scaled height set before). Change Right= to the resolution's full width. 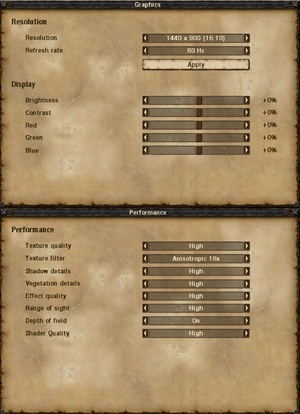 The sizing of the HUD, fonts, and inventory/map/journal screens can be changed by adjusting the values for both VirtalWidth= and VirtalHeight= (use values that still equal a correct aspect ratio for the resolution you are using). Non-default settings will cause some minor positioning issues. Desktop cursor will appear in-game. 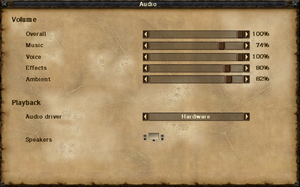 Quicksave, quickload and some other keys are locked in the binds menu. Can be edited in ConfigUser.xml. Find SensitivityX="0.5f" and change 0.5 to a value of your choosing for X-axis sensitivity. Do the same for SensitivityY="0.5f" for the Y-axis sensitivity. 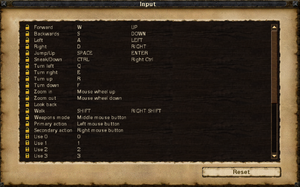 Does not affect mouse sensitivity in menus; only affects mouse-look speed during gameplay. Minimum value is 0.0; maximum value is 1.0. Negative values also work but won't increase the range, and invert the axis'. Recommended values are 0.0 for X axis and 1.0 for Y axis. Music, voice, effects, ambient and master volume. Install the Microsoft Visual C++ 2005 SP1 Redistributable Package (x86). ↑ 2.0 2.1 File/folder structure within this directory reflects the path(s) listed for Windows and/or Steam game data (use Wine regedit to access Windows registry paths). Games with Steam Cloud support may store data in ~/.steam/steam/userdata/<user-id>/40300/ in addition to or instead of this directory. The app ID (40300) may differ in some cases. Treat backslashes as forward slashes. See the glossary page for details.